a resting place for overachievers. i can survive for three months on a good compliment. - oscar wilde. The pattern is on it's way guys. Sorry I haven't had a chance to get it up yet. I was working out some bugs in it and will have it up tomorrow sometime. I'm having a friend of mine test it out to make sure I caught all the errors. cool!! can't wait for the pattern/tute!! And thanks for sharing...those are as nice if not nicer than alot of the knitted ones i've seen!! my needle shall be awatin for ya!! I will patiently wait for the new pattern! It's very good of you to share the pattern, and especially to check it first. (It saves us a load of undoing! ). I'm sure eveyone appreciates the effort you're putting into this. They are fantastic! I have been searching for a pattern like that for weeks! You are soooo great to share with us. THANKS!!! I am up for Personal Swaps. Bump.... if anyone has any questions, just let me know. I'm going to start them tonight, I'll let you know how it goes. ok I started it... but unfortunately it was with chunky yarn and a K needle and it came out waaaaaay too thick. so i frogged it. I'm guessing worsted weight and a h hook would work a lot better... what did you use? Oh I am so sorry I forgot to say what hook I used. I used a G hook. I'm pretty much a semi-beginner crocheter but I thought I'd be able to do this but I'm sorta stuck here. I got the sl st into the first 8 ch but it's the ch1 sc in each sc that's got me stumped. Is there anyway you can explain it differently? 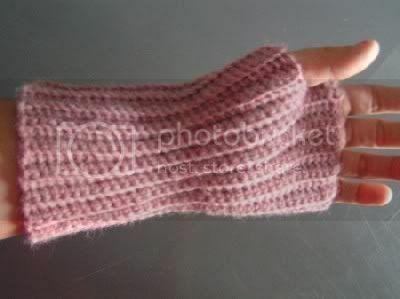 I've figured the sl st makes the thumb area but.. what I don't understand is if it's in the first 8 stitches.. where does it actually connect to the rest of the.. wristwarmer? ahhhh sorry! After you make the 8 sl stitches, you will ch 1 and then continue down the row doing single crochets. Then you will turn the work and do the next row right up until the sl stitches. This will create the short side of the glove (thumb part). I hope that makes sense. Let me know. ok, it's starting to make more sense now I will try it and let you know. Thanks! Ahh, I wish I had saw this thread before I started crocheting a scarf this weekend. I don't really need another scarf, but the yarn was too soft and fuzzy to resist crocheting into something. Thanks for the awesome pattern Lydia! I am a beginner at crochet, but I have made it most of the way through this pattern. I am stuck at where you finish off the wristwarmer. I end up on the long side of the glove, but it says to slip st the short side first. The only thing that I can think of is that "finish off" is a stitch all the way up. Is that right? If so, what kind of stich? Also, if you don't sew the thumbhole, then isn't the top eight lines of the crochet left open (instead of an opening, a slit?)? Should you sc three lines or something and then slip st? I am so confused! Somebody please help! I'm actually working on a pair right now...so when I get to the last part where you sew the sides together, I will take pictures to make it clearer for those who are confused. OKay here are some pictures to hopefully help you all with the finishing off part. The next step is to fold the short edge up to the long edge matching them up. You'll still have a small bit on the long side that isn't matched up, that will be the top part of the wrist warmer. Slip stitch the seam you just folded till you get to the end of the short side. NOw match up the two sides of the long side and slip stitch them up. They should look like this when you are done! I hope this helped some. Oh, I see it! Thanks so much! The pictures really help- I only hope mine turn out as lovely as yours.